Microstep: Set aside even just five minutes to meditate. I’m planning to create a morning routine that starts with meditating for five minutes when I wake up, instead of checking social media. By checking social media in the morning, I end up staying in bed for longer, and then feel rushed while getting ready. I start the day focused on other people and what they are up to, instead of giving myself a time to reflect and set my day up for success. We all know the many benefits of meditation, from helping to reduce stress and anxiety (which I experience on a daily basis) to improving sleep and focus (also areas I struggle in). By practicing five minutes of meditation each morning, I will not only be able to create a better morning routine, but I will be able to help all aspects of my life improve. Working at Thrive Global has its perks, which include visits from Arianna’s VIP guests. Andy Puddicombe, the founder of Headspace, visited Thrive Global recently and provided our company with free membership to the app. I plan to use Headspace’s many meditations in order to keep myself on track, and look forward to getting started tomorrow! I meditated every morning the first week, except for Sunday, when I meditated at night. I went out Saturday night and did not feel like getting out of bed in the morning. The first couple days I felt a little anxious not immediately reaching for my phone. Instead I let some light into my room, took a few deep breaths, and got out of bed. I usually spend at least 10 minutes checking my phone in bed, so it felt good to not linger around and get my morning going. After washing my face and drinking water, I settled down on my couch for my five minute meditation. I’ve started with the Basics pack on Headspace. After meditating a few days in a row, I definitely noticed a difference in my mood. On Sunday, I started the day by checking my phone in bed, and mediated at night instead, and I did not feel as great throughout the day. By the end of the week one, I still feel a little anxious not reaching for my phone in the morning, but as soon as I meditate, that feeling goes away. The second week of my experiment, I meditated every morning except on Thanksgiving. I decided to do an early Soulcycle Turkey Burn class on Thanksgiving, and did not leave enough time to meditate before. I definitely notice a difference when I meditate in the morning vs. when I don’t. I feel more clear and calm throughout the day. I started to slack on my Microstep during the third week, completing it only four out of seven times. This was due to either having early morning workouts and opting to sleep a little longer before them, or being interrupted even though I had the intent to meditate. My Headspace pack had moved on to 10 minute sessions, so I have a feeling that the extra five minutes has made this slightly more difficult for me. I was definitely more distracted this week, and felt like I could not focus. During the first two weeks, I only missed my meditation once, so for my final week, I felt like I needed to get back on track and make sure I made time to practice my Microstep. 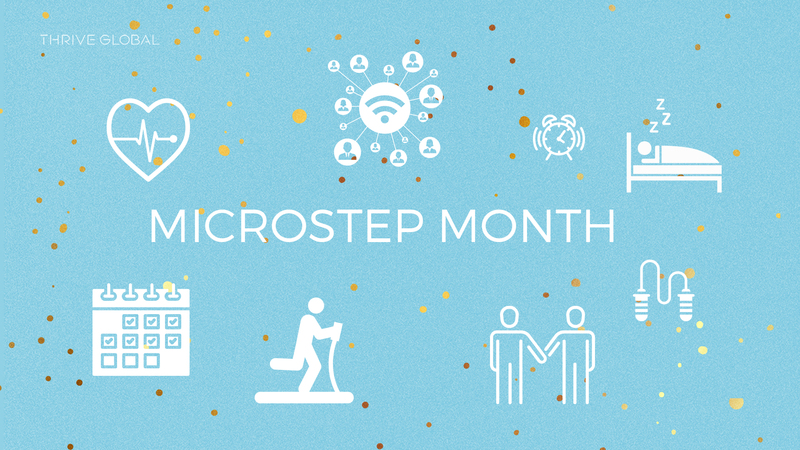 I completed my Microstep every other day during the last week. The days that I did not complete it, I either worked out in the morning or was in a rush to get to work. I definitely felt more focused and calm throughout the day when I complete my Microstep first thing in the morning, and that feeling stuck with me. After the 32 days, I would consider my Microstep a semi-habit now. I think I would have been more successful if I stuck to five-minute meditations, instead of trying out different meditation lengths. Out of the 32 days, I completed my Microstep 25 times. I plan to keep up my Microstep, but I’m allowing myself the knowledge that it won’t happen every morning. My stress has definitely decreased since starting this challenge. I saw an almost immediate difference in my stress levels when I started my day meditating vs. checking my phone. By taking a few minutes to focus on myself each morning, I was able to go into the day with a clear mind. Checking my phone first thing in the morning would cause me to feel stressed and rushed in the morning. Even if I don’t have time to meditate, I still plan to not look at my phone and take a few deep breaths before starting my day. Kirsten joins Thrive Global as a Project Manager, Corporate Product. She comes from a background in client success at Glassdoor, where she worked with SMB and mid-level companies on their employer branding strategy and recruiting goals. Prior to Glassdoor, Kirsten graduated from the University of Southern California with a degree in Business Administration and a minor in Communications. She loves to stay active through running, yoga, and skiing, and enjoys to travel and explore new restaurants in her free time.